The theme for the March swap on Stitchin Finger fabric postcard swap. At this time of year, it made me think of all the green shoots appearing as spring progresses. The first signs of spring we saw after the snow, were the snowdrops, so that was what I used for my postcard. I tried a completely new technique with this card. 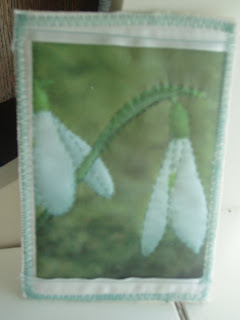 I copied a photo of snowdrops onto fabric and then hand quilted around the image and the snowdrops. The top and bottom edge were finished with satin ribbon and then the card assembled. D was fascinated at being able to copy photos onto fabric and deduced I would be able to do the same with his photo. Me thinks he has been reading my mind, I have thought of doing something with photos of the boys and making either wallhangings or cushions for them. However, that project will have to wait. I have lots of projects in the pipeline at the moment and hopefully, some of them might get somewhere near completion this weekend. The boys are away, so I have two days of uninterrupted fun. At least, that is the idea, but it doesn't always happen like that. That looks so fresh and pretty! That's lovely! I've thought of printing photos on fabric for a couple of projects but I haven't gotten around to it yet. Cool idea and it worked out well. I see a lot people use that technique of printing on fabric. Did you use specially made fabric or find some way to stiffen your own fabric? Darling card with the snowdrops! Yes, Spring. Your postcards is lovely. I've never tried the technique of photo to fabric either, but I've wanted to try for a while. Your card looks fabulous! The stitching around the flowers really made them stand out.